Yesterday morning Dawn and I made a few Valentine items for the kids class party and their teachers. Caleb & Isa wanted to bring the Valentine Bananas. Dawn found the idea on Pinterest - Cake Whiz . Check out our Banana's! So easy - we wrote on our bananas with black & red ink. 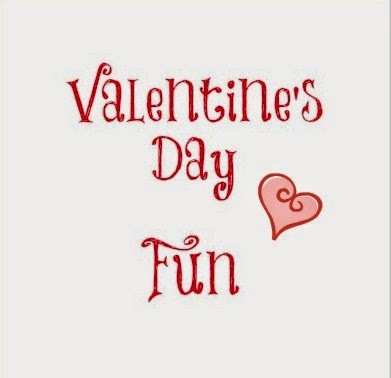 Dawn also found the perfect Valentine's for Davey's class - they party with K4 & K5 class. Sweet CS Designs had the cutest download. 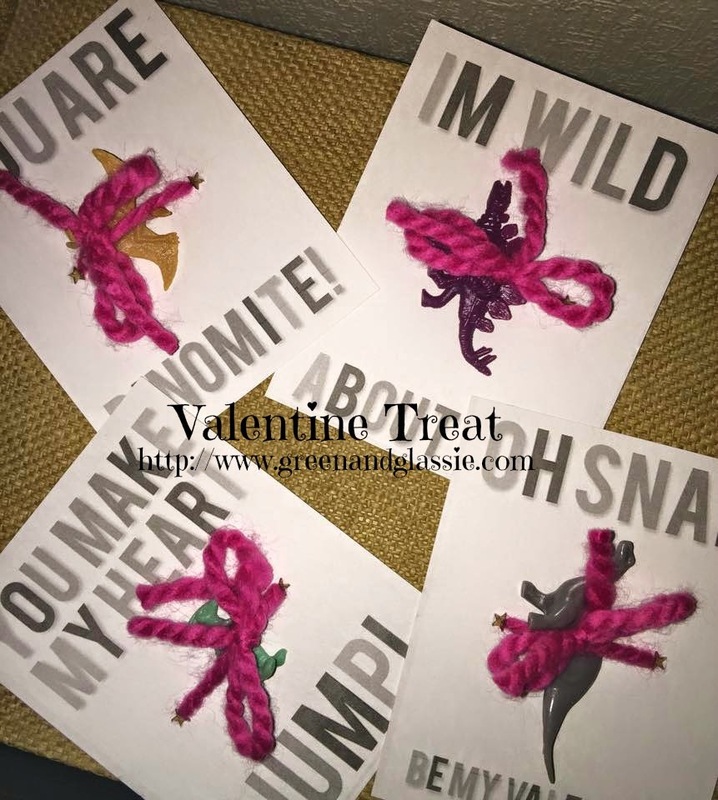 Our cards are a little different ~We used only black ink to print the cards and leftover yarn to tie on the dinosaurs. Dawn found 101 count dinosaurs container at Wal-Mart for $5.00. Lots of left over dino's for Davey to play with. 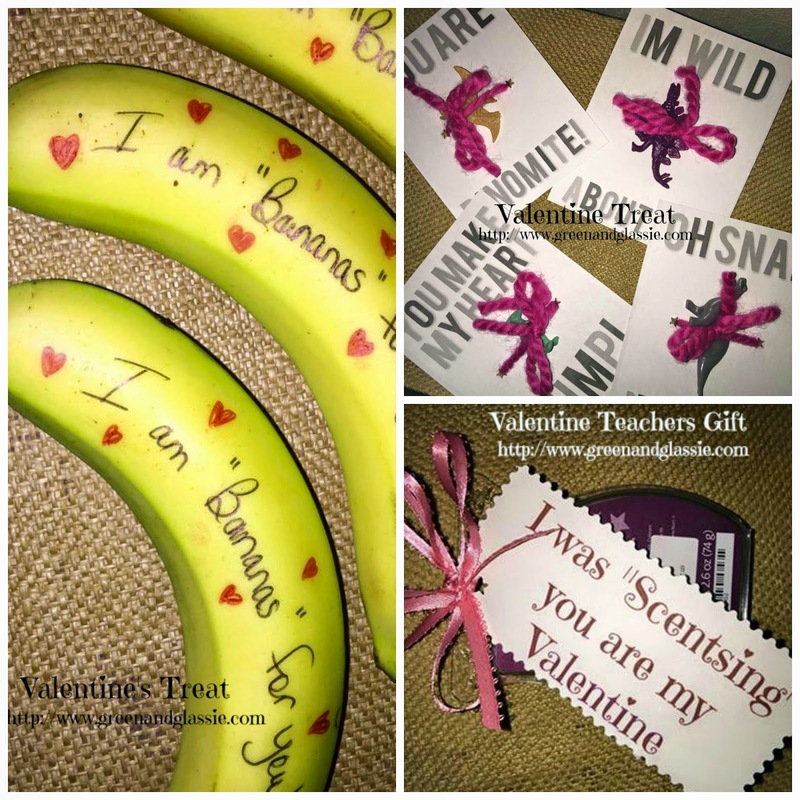 For the teachers gifts we made cards attached to Scentsy Wax. The saying is our own. It took us a while but we totally came up with the saying ourselves. Great ideas. My kids don't normally give their teachers anything because we hook them up at the end of the year, teacher appreciation week and Christmas. These are great ideas. I always put together a small basket for the teacher when my son was in school. Now you have me thinking....maybe I should send something in with the kids. These are really cute ideas for teachers! I love the bananas too! Aww! Teachers must feel so appreciated every time they receive gifts like these. Very cute ideas!! I love the bananas idea! Actually I love all of these ideas! These are all so cute! I am bananas for you, LOVE IT! The banana is perfect, I hate that they bring home so much sugar that day. What happened to cute little cards? How original! I'm new to bringing things to my kids class rooms but always liked the idea of gifts verses candy. I love the banana idea! So much better than adding to the massive amount of candy they'll be bringing home on Valentine's! What great ideas! I would love to treat my kids' teachers & their classmates something that isn't always candy. All of these ideas are brilliant! those banaa ones are my favorite for sure. Makes me think of the minions. What cute and frugal ideas! I love the bananas the best! Oh, I love the bananas! Simple and cute. I think I'll do that for my daughter's teachers. These are adorable and great ideas! I especially got a kick out of the Scentsy one! The banana valentine just kills me. That is so darn cute! I just love these ideas. They are awesome. I love the banana one. My kids aren't allowed to bring them to school, which is a huge shame because they are all of our faves but i would for sure do that one. Super cute and creative! That a creative gift to give a teacher. I love all of these ideas! I love the banana idea, it's super cute! My daughter likes bananas a lot and would probably be thrilled to receive one those on Valentine's day! SUCH great ideas! The bananas are my favorite! I just love the banana idea. my girls would love seeing little notes like that on their fruit! Those are all really cute, but I love the Scentsy one! teachers would love that! Thanks for the ideas! What an awesome idea! Very Creative!! I think they will love these! The bananas are so cute! I never thought to give a teacher fruit before, believe it or not. These are great ideas! The bananas are absolutely adorable! The idea with the bananas is absolutely priceless. Love the bananas idea. Now that we're in our first year of public school, it amazes me how many gifts we have to bring. These fun ideas make it a little less tedious. These are adorable! I love the bananas! So cute! Ha! A Scentsy thrown in the mix, I love that one. 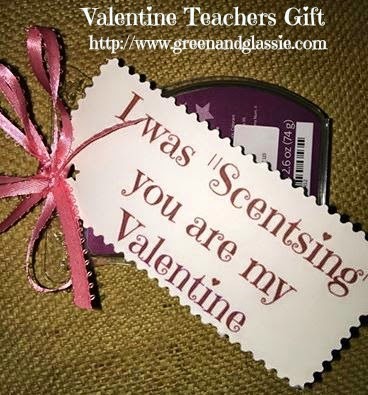 Scentsy is a great gift idea for the teacher. Those are all such cute ideas! I think I am going to do the banana and stick it in my daughter's lunch on Friday! What a clever idea! No kiddos, but I will surely be doing this for my husband, lol! I love these ideas. It is amazing what you can find when you search pinterest. These are all great ideas. I especially love the bananas! Very cute ideas. Love the banana and dinosaur idea! 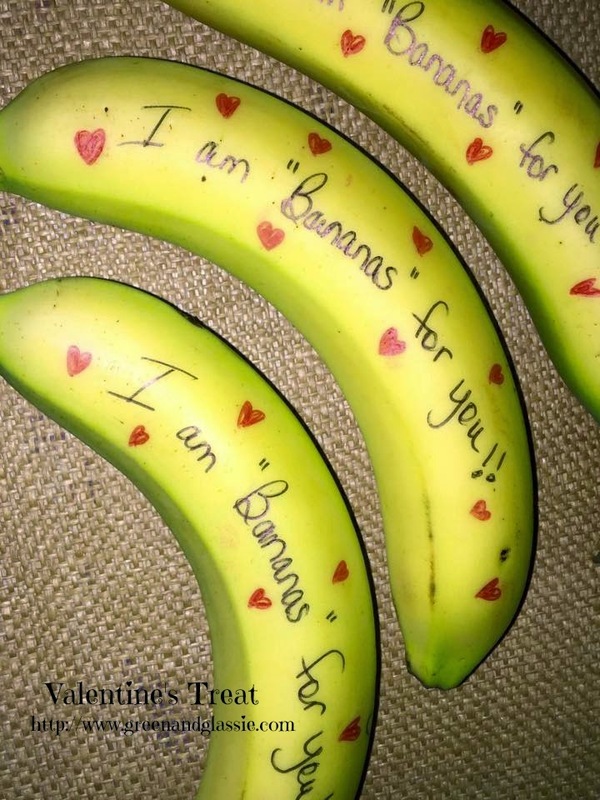 I love the banana Valentine idea. We are not allowed to send in lolly pops this year, so this is perfect. These ideas are really cute and different. That's just what teachers need. There are only so many boxes of chocolate one can eat. I used to put little notes in my kids lunches when they were younger. I never thought to write on a banana. These are great ideas. Cute!! I love that they are unique Ideas. Great printable ideas!! I love gifting the teachers something cute on Valentine's Day. I love the banana! Those are too cute. I really like that idea. I love the banana idea. I should have done that for my son's valentine's party yesterday. The scentsy bar is genius! I totally should have done this for my son's teacher. This is such a cute and simple idea. Must remember this for preschool!